As far as China’s growing dominance of other nations, no countries are cited. Surely reference is not to Japan or India or Vietnam, which are increasingly building up their militaries to resist China, in concert with the U.S. And of course not to Russia, an important Chinese neighbor. Australia and South Korea have expressed some concerns about their economic relations with China, but one would not begin to think of them as dominated by China. The Philippines did cut a deal with China (over some reefs) but also one with the U.S. – over reuse of its military bases. China is losing influence in Myanmar. It does command some influence over Cambodia and Laos. However, the way to counter such influence is to offer them investment and trade deals on better terms than China has offered, rather than spend hundreds of billions on a military buildup. There is considerable evidence that China would prefer to see friendly nations on its borders rather than ones that house American forces, build up their own militaries, and conduct military exercises together with the U.S. However, as I already suggested, there are very few signs that China is making progress in advancing this limited and regional goal. Few would disagree that China would like to be recognized and respected as an important international player. However, it has shown very little sign of seeking to become a global power, let alone supplant the U.S. The legitimacy of China’s regime is based on bringing affluence to its people – not on bringing its regime to other nations. It has long lost whatever messianic ambitions it had. And it faces immense domestic burdens that compete with any notion of world rule. China’s population is aging and – as a result of the one-child policy – it faces an increasing challenge to find the workers who will pay for and attend to the growing senior sector. It faces major environmental challenges, and half of its population is keen to get what the more affluent part recently acquired. Alarmists point to the new Silk Road as evidence that China is seeking world dominance. It’s surely looking for more secure pathways for trade because its economy is highly dependent on a steady flow of energy and raw materials. However, the traffic on the roads and rails China is building is not limited to Chinese or pro-Chinese traffic. And increasing commerce is what the U.S. long championed as a mainstay of the world order. Further, China has recently increased its contributions to peace keeping operations, humanitarian aid, and support to global development banks. And in Davos, it showed its support for free trade and the Paris climate accord. It is the US that is retreating on all these fronts. It is the U.S. that is seeking to change the rules of the game at WTO – after China won a few cases in this forum. Particularly odd is for the U.S. to see a sign of trouble in China’s support for authoritarian regimes. The U.S. is a close ally of Saudi Arabia, a major supporter of the authoritarian regime of Egypt, and increasingly a friend to Vietnam. People who live in glass houses should not throw stones. 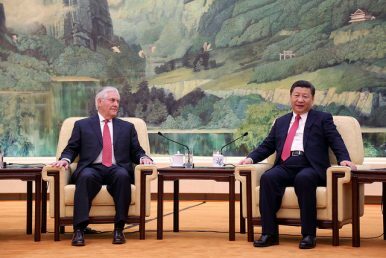 One should also recall that in order to deal with North Korea, a major strategic and immediate threat, the U.S. will need the collaboration of China (an argument laid out here). Above all, the notion that the U.S. would downgrade the fight against terrorism, a major priority for the last 15 years, is a regrettable one. ISIS is gaining influence in at least a dozen countries. Massive unemployment, especially of young and educated people in Africa and the Middle East, poses fertile ground for terrorism and immigration waves that are destabilizing Europe. The fact that the U.S. military has not learned how to deal effectively with forces like the Taliban does not mean that it can walk away from the Middle East and choose instead to focus on the Far East. We should expect terrorists to find a way to remind the Pentagon where its strategic threats truly lie. Amitai Etzioni is a University Professor and Professor of International Affairs at The George Washington University. He is the author of Avoiding War with China and of Happiness Is the Wrong Metric: A Liberal Communitarian Response to Populism (Springer, 2018).